They will grow in any well drained soil, in full sun, and will reach up to 1.2M tall when in full flower. On receipt, plant deep like bulbs, not like a bare root - and feed well when shoots emerge. Then leave! 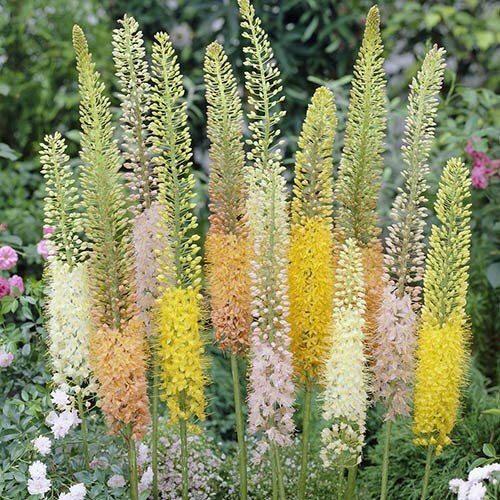 It's not hard to see wy these are called 'Foxtail Lilies' - their huge long flower spikes are a dusky orange to red colour, and like a fluffy Fox's brush! 'Ruiter Hybriods' were one of the first series to be bred, and contain a mix of shades, being raised from seed. They cover yellow, coppers and reds, to pink and creamy white, and all shades in between. They are grown for their amazing statuesque tall flower spikes borne in high Summer they add a classic Cottage garden feel and height to any mixed border garden. They do make stunning cut flowers too in a vase, and will establish into slow-spreading clumps every year. Often perceived as tricky to grow, the secret is in planting well. Although they are roots, they need to be buried like bulbs, with the roots well spread out. Ensure they have plenty of Winter drainage, but good sun and warmth in Summer. Supplied as a pack of 3 root tubers, to be planted deep in fertile and well-drained soils.